I have long been at war with everything antibacterial. The world is too clean and the kids in my town barely get a smudge on them before their parents swoop in with wet wipes and hand sanitizer. So, admittedly, I felt a little smug reading the latest study in Pediatrics that found children in households that hand washed their dishes had a lower risk of developing allergies than in households using dishwashers. Researchers at The University of Gothenburg in Sweden surveyed the daily habits of households of 1029 children aged 7 to 8 in Kiruna and Molndal, Sweden. A questionnaire sent to the households asked whether the children had any history of asthma, eczema and rhinoconjunctivitis. Five of the questions asked about the child’s eating habits including, how they washed their dishes, if the child ate fermented foods (i.e. sauerkraut), and if eggs, meat or unpasteurized milk was bought directly from a farm. The researchers also looked at possible outlier information, such as whether a parent smoked, if the family had pets, if the child had siblings and whether they attended a daycare. Following a five step statistical analysis that adjusted for all these variables, the team found that children in households that hand washed dishes had fewer allergies. 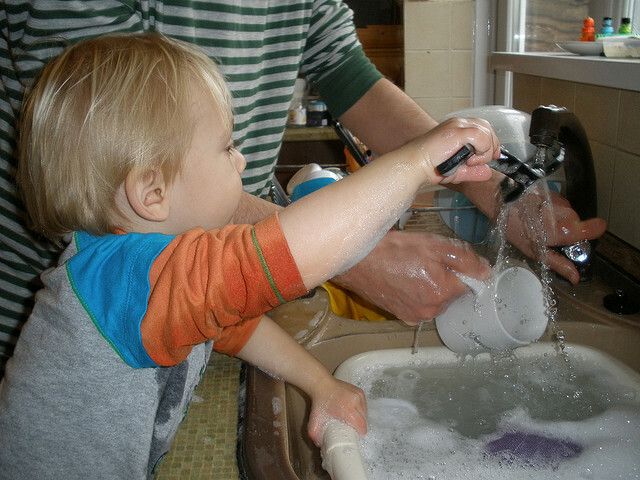 In the hand dishwashing households, 23% of children had eczema, while machine dishwashing households reported 38%. For asthma the numbers were 1.7% and 7.3% respectively, and 10.3% and 12.9% for rhinoconjunctivitis. Researchers also noted that households that “ate fermented food or bought food directly from farms in combination” with hand washing dishes reported even lower allergies. Researchers believe the bacteria residue left behind on utensils and dishware from hand washing helps build tolerance to allergens. This finding supports the hygiene hypothesis which believes that bacterial exposure during early childhood helps build immunity and reduces the risk of developing allergies. Generally, studies agree that low hygiene standards and an increased exposure to bacteria often mean a lower risk in developing allergies, but you don’t need to sell your dishwasher just yet. Although, if you wanted to, it certainly wouldn’t hurt to start hand washing your dishes and see if the kids sneeze less.